If you still have your solar viewing glasses from the eclipse, now is a good time to slap them on and look up at the sun. You'll see two big dark areas visible on our star. These massive sunspots are regions of intense and complicated magnetic fields that can produce solar flares – bursts of high-energy radiation. You can just make them out with solar viewing glasses, but they're better viewed through a solar telescope. These two huge sunspots are currently causing quite a bit of consternation and interest. The solar storms they've sent toward Earth may affect communications and other technologies like GPS and radio signals. They're causing amazing displays of the Northern and Southern Lights. And space weather scientists like us are excited because we wouldn't normally expect this much activity from the sun at the moment. The sun goes through 11-year cycles of solar activity. What scientists call a solar maximum is the time in the cycle when the sun is putting out the most energy. That's when we tend to see the most sunspots, solar flares and associated solar storms. Some solar maxima are larger or more active than others – such as the 1990-1991 solar max. But this last cycle, which peaked in 2014, was quite small, and there were few large geomagnetic storms. 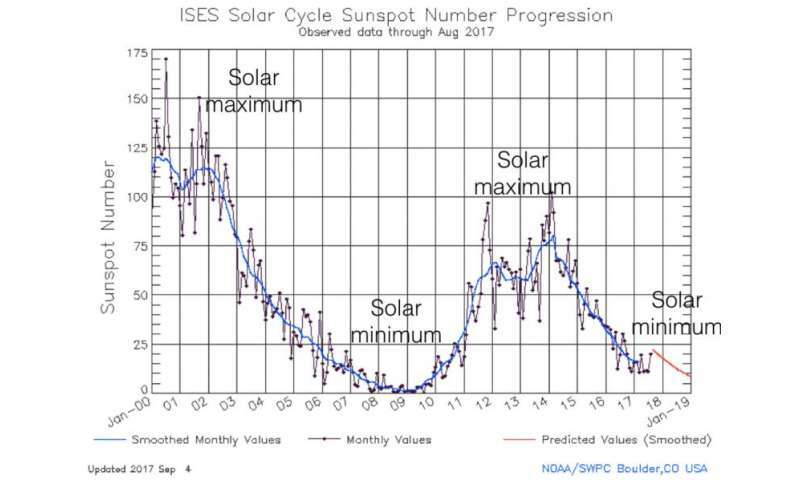 We're heading into the bottom of solar minimum, when the sun tends to have fewer sunspots, solar flares and coronal mass ejections – large expulsions of plasma, electrons and ions, and magnetic fields. But despite where we are in the sun's cycle, activity on the sun has dramatically picked up over the past few days. On and off, these two sunspots have been flaring and shooting out coronal mass ejections, directed toward Earth. So what's going on with the sun? And should we be concerned about this somewhat out-of-character solar behavior? On September 4, the sun started sputtering. A moderately large flare (classified as an M5.5) erupted at approximately 18:30 UTC. It produced a coronal mass ejection aimed at Earth. The sun continued to flare on September 5. A solar energetic particle event from the previous day's activity arrived at the Earth, where it likely affected radio communications as well as the health of satellite systems. 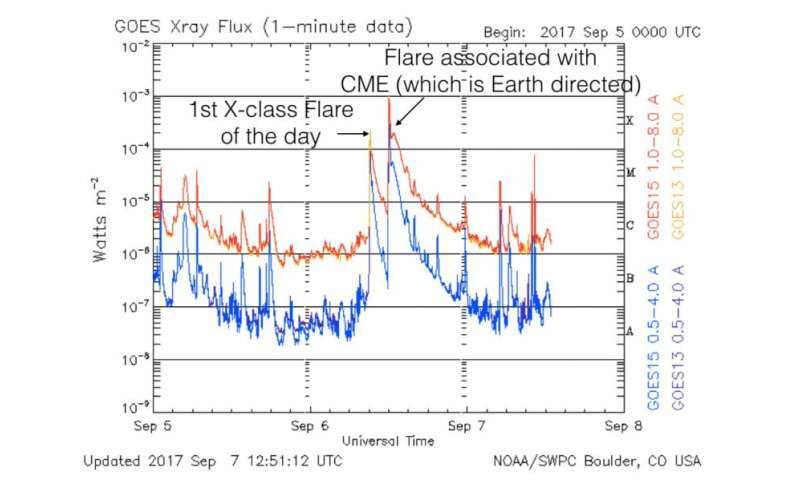 On September 6, the sun produced two massive X-class flares. This is the category for the strongest of all solar flares. NASA announced one was the most powerful since at least 2008. It produced another coronal mass ejection. Over the next day, the same sunspots continued to spit out more solar flares. It took about an hour for the solar energetic particles they emitted to arrive at Earth. These protons are incredibly fast-moving. They can affect communication systems, typically in the polar regions where they are more likely to enter into the Earth's atmosphere. As with all increases of radiation in space, they can also affect satellite systems and the health of astronauts. Early in the morning hours of September 7 in the U.S., that first coronal mass ejection that erupted from the sun three days earlier arrived at Earth. Because of the way its magnetic field aligned with Earth's, it generated only a small geomagnetic storm. After being detected by spacecraft upstream from Earth in the solar wind, the massive coronal mass ejection from September 6 also hit Earth on the evening of September 7 EDT. Its arrival was a few hours earlier than space weather forecasting agencies around the world predicted. What other effects will Earth see? All this solar activity has already caused a couple of radiation storms in Earth's high latitude regions that blacked out radio communication at certain frequencies. The impacts extended toward the equator and have affected high-frequency communications, including ham radios, which are used in emergency and disaster relief management. Radio fade-out maps from the Australian Bureau of Meteorology show that high-frequency radio communication disruptions have likely occurred in the same areas being pummeled by Hurricane Irma. There has likely been a loss of global navigation system satellite communications in those same areas, but it will take time for the data to be analyzed and for us to gain a full understanding of how this space weather activity has affected those on the ground. The radiation storms may also force flights over the polar regions to reroute to avoid increased radiation exposures for people on board and potential loss of communication and navigation systems for aircraft on these paths. With the collision of the coronal mass ejection from this X-class flare with Earth come other impacts for the near-Earth space environment. Geomagnetic storms, like the one currently in progress, are known to wreak havoc on a range of satellite and ground-based communication technologies, as well as power grids, GPS/GNSS, and orbit predictions of satellites and space debris. It is also very likely to produce dazzling aurora activity as far south as the northern U.S. and Europe in the Northern Hemisphere, and as far north as southern Australia and New Zealand in the Southern Hemisphere. While scientists and aurora-hunting enthusiasts closely watch the storm's ongoing effects, others will be bracing for problems and disruptions to the many technological services that will be affected. We don't need to worry about this coronal mass ejection being "the big one" – a solar storm direct hit that could cause widespread power blackouts and trigger as much as US$2 trillion worth of damage, according to a National Academy of Sciences study. But this storm, on the back of this month's abnormally active space weather, may wind up on the larger end of the scale, and will be the subject of lots of analysis and research. We don't yet fully understand everything that is happening. But the activity over the past few days, when the sun should be within its quietest period, shows that significant space weather events are possible at any stage of the 11-year solar cycle. You can help us study this and other solar storms as a citizen scientist. Sign up for Aurorasaurus and let us know if you observe aurorae with this event. It is also no coincidence there was a large 8.1 earthquake that occured off the coast of Mexico in the past few hours. Neat! I didn't know earthquakes were considered "space weather"! Neato, cherry-picked earthquakes matched to cherry-picked solar storms. When do we get the picked-cherry pie? According to the advocates of Global Warming; solar flare activity means absolutely nothing to the weather on Earth as what happens on Earth is independent from solar activity. Mego-sunspots on the Sun , Mega-hurricane storms on Earth at the same time.........naw, just my imagination running wild, kinda like believing infinite gravity wells can be found on a finite stellar mass. 75% predictive ability on earthquakes 7.0 and above is pretty good in most books. In other news, Barney the Dinosaur appeared on Idaho television stations for 15 episodes in August, and Nebraska had 15" of rain. Coincidence? You decide. You guys do realize that Barney is coming back real soon now, right? We'll have many new episodes, and they will no doubt create many severe hurricanes, floods, and earthquakes over the coming years. Ban Barney! If you were banned then the entertainment factor from which I enjoy bouncing off so many of my Comments would be reduced to near zero. What with Stumpo & a couple others of the foulmouthed profanity brigade having been banned, I'm beginning to run out of the FUN FACTOR for coming here. I mean like, anyone who can believe that an infinite force of gravity can exist on a stellar mass only a few miles in diameter is someone anybody can have a lot of fun with. And, tone it down with the foul mouthed profanity laced Comments, I don't want you getting bounced off here, I have never clicked a Report Abuse on you but if you keep up with the Stumpo Stuff I just may, and if you get kicked off I won't have much purpose for being here. Re that Earthquake: in that region, it is due to Tectonic Plate 'collision' between South/North America etc plates; so Seismic activity, and any Volcanic complications triggered by same, occur when pressures/stresses reach a sensitive 'last straw' stage (as in the saying: "The last straw that broke the Camel's back"). Moreover A LOT of electric currents are generated via PIEZO-ELECTRIC phenomena when certain materials get 'squeezed/ground' in the crustal layers/faults. Re Hurricanes: they've ALSO occurred when Sunspot/flare activity was LOW; so NO direct correlation. CO2 causes storms? not the Sun?